Mike Hallick, aka Mantaur, aka Tank is one of those wrestlers who makes the argument that it’s better to be infamous than to be famous. Starting his career in Europe, Hallick made his notorious debut in the WWF as Mantaur in 1995. Wearing a gigantic bull’s head to the ring, he was billed as half man, half beast (really), even though the mask would come off when he would wrestle. In his matches, he would continue to sell the gimmick by snorting, charging, and yes, mooing. Mooing. At least he was getting booked, right? He had some minor feuds with Razor Ramon and Bam Bam Bigelow before leaving the company. He had a brief run in ECW, then had an even briefer return to WWF as Goldust’s unnamed bodyguard during a feud with the Ultimate Warrior. In 1997, he made his way to the USWA as Tank, where he won the World Title from Jerry Lawler, holding it for one week and then dropping it back. Hallick now makes sporadic appearances with independent promotions. 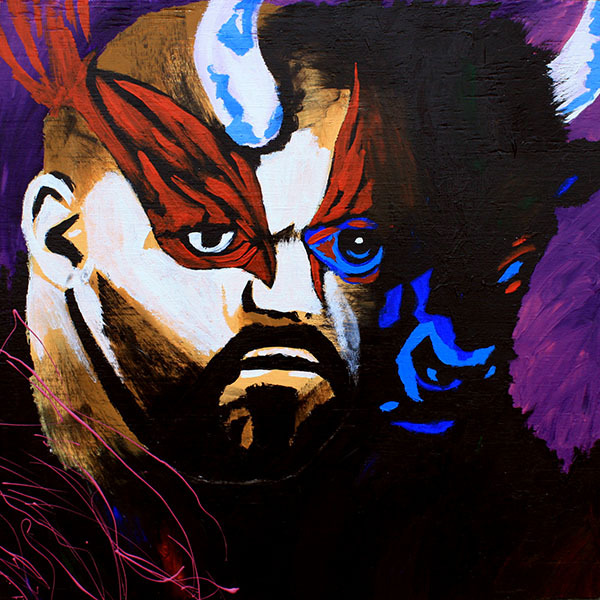 The Mantaur gimmick is the one that stuck, as one of the most ridiculous in wrestling’s history. While he may not be remembered for other reasons, he’s remembered nonetheless, and that’s one of the really fun things about wrestling. About the piece: I wanted to incorporate both his unmasked and masked looks, while also having fun with the Mantaur persona. Taking inspiration from comic books, I attempted to show him making the fantastical transformation from man to…MANTAUR!